Developed and hosted by videographer Craig Syverson, videogrunt illustrates the basic terms and technologies of digital video through bite-sized video narratives. Designed for the novice, but useful for anyone wanting to learn how digital video works. videogrunt program 005: The third (and best) way to view material when the aspect ratio of the source (i.e. the movie) does not match the aspect ratio of the viewing screen (i.e. the TV). For program notes and the text of the script, please visit: http://videogrunt.com © 2006, gruntmedia This work is licensed under the Creative Commons Attribution-NonCommercial-ShareAlike2.5 License. videogrunt program 004: When aspect ratios don't match, compromises have to be made. This program explores the pan and scan process used to get widescreen movies to fit on traditional television sets. For program notes and the text of the script, please visit: http://videogrunt.com © 2006, gruntmedia This work is licensed under the Creative Commons Attribution-NonCommercial-ShareAlike2.5 License. podgrunt program 001: This inagural program uses a basic diagram to illustrate how simply a podcast works. Remember that this is a sequential series, so it's a good idea to start from the first program and view in order. We'll have videogrunt program 4 ready in a week or so.. For program notes please visit: http://podgrunt.com © 2006, gruntmedia This work is licensed under the Creative Commons Attribution-NonCommercial-ShareAlike2.5 License. 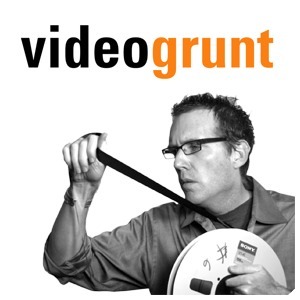 videogrunt program 003: Continuing on the discussion of aspect ratios, we show how 16:9 came about as the optimal compromise between the world of film and video. Our hero this time is Dr. Kerns Powers of the David Sarnoff Research Center. For program notes, the text of the script and other verisons of this media, please visit: http://videogrunt.com © 2006, gruntmedia This work is licensed under the Creative Commons Attribution-NonCommercial-ShareAlike2.5 License. videogrunt program 002: Our first main subject is about the convergence of standards and technologies from the three worlds of motion pictures, television and digital video. Starting with the concept of picture aspect ratio, we trace back to Thomas Edison to find where the *standard* 4:3 ratio originated. For program notes, the text of the script and other verisons of this media, please visit: http://videogrunt.com © 2006, gruntmedia This work is licensed under the Creative Commons Attribution-NonCommercial-ShareAlike2.5 License.